A special thanks to Greats for sponsoring this post. All opinions are my own. White sneakers have always been a classic. They add a touch of coolness and versatility to almost anything you wear. Greats is the first sneaker brand to be born in Brooklyn and they bring the style and spirit of Brooklyn to the world. Their designs are inspired by the most iconic silhouettes in the business and the result is made in Italy luxury sneakers at 60% off retailers price. It feels great to wear them as they are comfortable and stylish. Truly, they are great! I was tempted to get the blush color but hadn’t gotten any white sneakers in a while, so here I am wearing the Perforated Royale Blanco. I’m so excited because I can pair them with countless outfits. You’ll be seeing these on repeat for a while for sure because I can’t just yet get enough. There is nothing better than a pair of fresh white kicks! They are just so cool and casual but still can elevate a look. How cute are your Greats sneakers?! Loving your classic styling! And I LOVE Wynwood – so much fun over there! I’d never worn this brand before but I love a classic white pair of shoes! These are great! 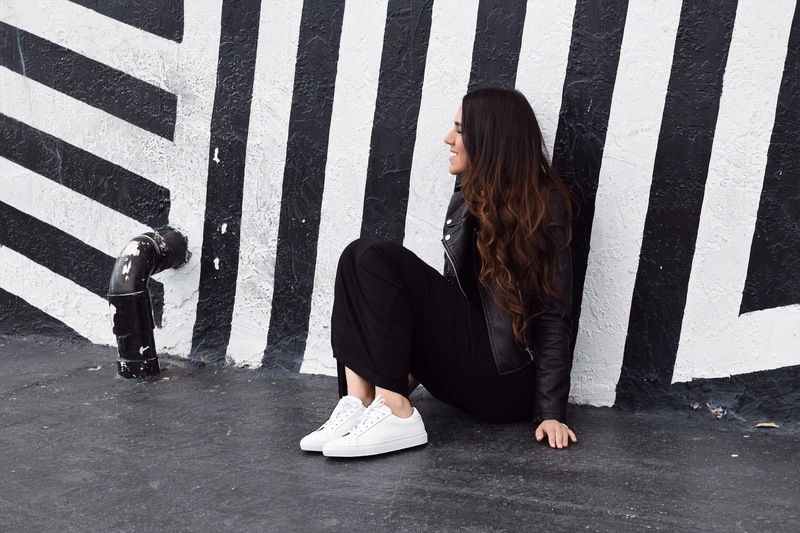 White sneakers are a necessity for any wardrobe! They look good paired with almost anything, and add such a feminine flair to outfits. I absolutely love them like this, styled with a dress. Plus, they are literally so comfy. I will definitely check out these shoes. I adore Greats brand! The quality and attention to detail is everything you want in a sneaker. I have this pair in black and another pair that I adore as well. I don’t have them in white but I love them so! Do you find they run small? I had to get mine in an entire size up. Love that you paired them with this gorgeous black dress and leather jacket to give it some edge. Also, how fun is that wall behind you? Perfect location for this shoot! Ahh, you are so CHIC! White sneakers have always been a classic for me as well! This pair by Greats is too cool! I love how you paired it with this split dress and leather jacket.